The Sunrisers Hyderabad are coming up a strong performance at home chasing 198 against the Rajasthan Royals. Their bowling attack which has been their key strength has slightly erred in the two games played and they will look to rectify that. The Royal Challengers Bangalore are coming off two loses and will look to get some points on the board. They should also look to overcome the no ball controversy from the previous game and start fresh. The two teams have faced up 12 times, out of which the Sunrisers Hyderabad have won 7 games and the Royal Challengers Bangalore have won 5. In Hyderabad however, out of the 6 matches played, the Sunrisers have dominated winning 5 matches. Kane Williamson, for the Sunrisers Hyderabad, had a great tournament last year winning the Orange Cap. He has been in good form coming into this IPL, and is a proven performer. Having missed out in the previous game, we can expect Kane Williamson to come up with the goods sooner rather than later. Yuzvendra Chahal, for the Royal Challengers Bangalore, has been the go to bowler for them. In a day game where the pitch might take some turn against a team with 3 international batsmen at the top of the order to go with Manish Pandey who is struggles a bit to rotate spinners, Chahal can be a very handy option. His wicket picking ability will be key in restricting the Sunrisers to a reasonable score. The Sunrisers Hyderabad are expected to go with the same XI after winning the previous game. The Royal Challengers Bangalore after the controversial but close game against the Mumbai Indians, will still look to play the same team. Hyderabad produced a batting paradise in the previous game, but day games in gerenral have a tendancy to play slow and hence not support the batsman as much. Hence, we probably can’t expect a very high scoring game. The Sunrisers Hyderabad will start as favorites given their record and team balance. The Royal Challengers Bangalore will look at one of Virat Kohli or AB Devilliers to play an inspiring innings and take them home. 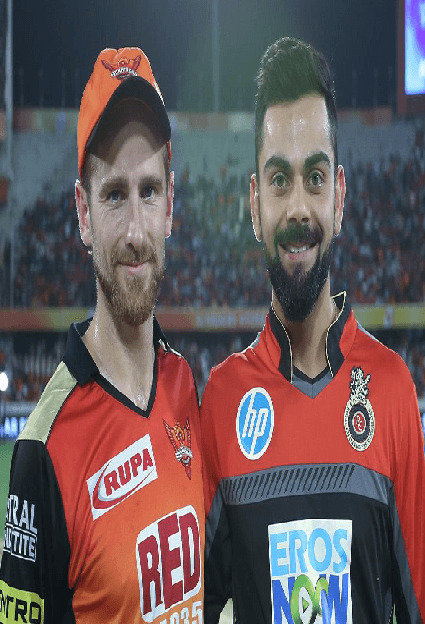 The Sunrisers Hyderabad should look to pick up wickets in the Power play which is the part of the game the Royal Challengers Bangalore have been very good last season. They could look at using someone like Bhuvneshwar Kumar to Kohli who has had some success against him in the past and Rashid Khan early on to AB Devillers for the same reason. They should also look at improving their death bowling which has surprisingly been an area of concern in the two games they have played. The Royal Challengers Bangalore should look to dismiss Warner out early who has been the driving force for the Sunrisers so far. They could look at using Chahal early on to Warner to get him out of his comfort zone of playing the pace bowlers.